Q.1 What will be the colour of the sky, when it is observed from a place in the absence of any atmosphere ? Why ? Sol. Black. As there is no atmosphere to scatter light. Q.2 The sky appears dark instead of blue to an astronaut. State its reason. Sol. Outside the earth, there is no atmosphere to scatter sunlight, so the sky appears dark or black to an astronaut in outer space. Q.3 Which phenomenon is responsible for making the path of light visible? Q.4 State one function of iris in human eye. Sol. Control the amount of light entering the eye. Q.5 State one function of pupil in human eye. Q.6 State one role of ciliary muscles in the human eye. Sol. Change the focal length of lens. Q.7 State one function of the crystalline lens in the human eye. Sol. It converges the rays so that image is formed on retina. Q.8 State two properties of the image formed by the eye lens on the retina. Sol. Image is diminished, inverted. Q.9 State one function of cornea in human eye. Sol. Converge the rays entering the eye. Q.10 What is Tyndall effect ? Sol. The scattering of light by particles in its path is called Tyndall effect. 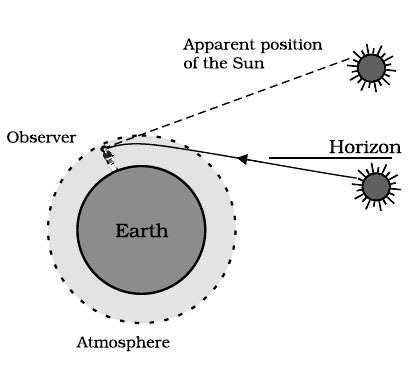 Q.11 Give an example of optical phenomena which occurs in nature due to atmospheric refraction. Q.12 Given an example of optical phenomenon where Tyndall effect can be observed. Q.13 Name the type of particles which acts as a prism in the formation of rainbow in the sky. Q.14 Why is the colour of clear sky blue ? Sol. The sunlight is scattered by the molecules of gases present in the atmosphere. Blue colour is scattered the most. So sky appears blue. Q.15 What is the cause of dispersion of white light on passing through a prism ? Sol. When white light passes through a prism, the different colours deviate at different angles due to the difference in their velocities when they pass through the prism. This causes dispersion of light. Q.16 Name the atmospheric phenomenon due to which the sun can be seen above the horizon about two minutes before actual sunrise. Q.17 Name the part of our eyes that helps us to focus near and distant objects in quick succession. Q.18 A person is advised to wear spectacles with concave lenses. What type of defect of vision is he suffering from ? Sol. He is suffering from myopia . Q.19 A person is advised to wear spectacles with convex lenses. What type of defect of vision is he suffering from ? Sol. He is suffering from hypermetropia or presbyopia. 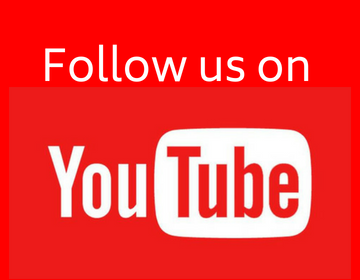 Q.20 Why do different components of white light deviate through different angles when passing through a triangular glass prism ? Q.21 A person can comfortably read a book but finds it difficult to read the number on a bus parked 5 m away from him. Name the type of lens should he use in his spectacles to correct his vision ? Sol. He is suffering from myopia. He should use concave lens in his spectacles. Q.22 Why does the sun appear reddish at sunrise ? Sol. At sunrise, the sunlight has to pass through a thicker layer of atmosphere. Blue wavelength is scattered the most, hence blue is scattered away, leaving mainly red colour which reaches our eyes. Hence sky appears reddish. Q.23 Why is red colour selected for danger signal lights ? Sol. Red colour is scattered the least, so danger signals are red in colour. Q.24 What kind of lens is used in the spectacles of a person suffering from myopia (near - sightedness) ? Q.25 When we place a glass prism in the path of a narrow beam of white light, a spectrum is obtained. 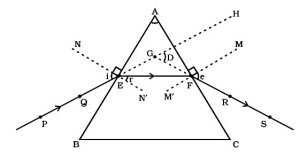 What happens when a second identical prism is placed in an inverted position with respect to the first prism ?Draw a labelled ray diagram to illustrate it. Sol. The various colours of spectrum merge to from white light. Q.26 A star sometimes appears brighter and some other times fainter. What is this effect called ? State the reason for this effect. Sol. Twinkling of stars Due to atmospheric refraction, starlight bends from its path. Due to continuously changing atmosphere, starlight varies causing it to twinkle. Q.27 A star appears slightly higher (above) than its actual position in the sky. Illustrate it with the help of a labelled diagram. 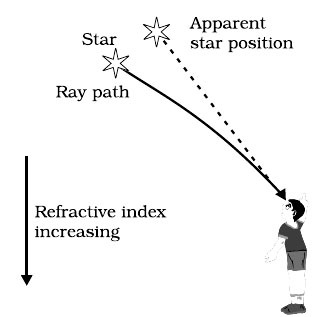 Due to refraction of light the star appears to be slightly higher than its actual. (i) the least and (ii) the most while passing through a glass prism. Sol. The splitting of white light into seven colors is called dispersion of light. (i) The colour that bends the least is red. (ii) The colour that bends the most is violet. Q.29 What is the colour of the clear sky during day time ? Give reason for it. Sol. The colour of sky is blue. This is because blue colour is scattered the most. Q.31 "The time difference between the actual sunset and the apparent sunset is about 2 minutes "
What is the reason for the same ? Explain with the help of a diagram. Sol. When the sun is below the horizon, the sun rays refracted by the atmosphere, reaches our eyes. So we can see sunrise before the sun actually rises. Similarly we can see the sun even after it has actually moved below the horizon. The apparent time difference approximate 2 minutes. Q.32 Explain why do the planets not twinkle but the stars twinkle. Sol. Planets are much closer to the earth and can be considered as a collection of large number of point sources of light. If some light from plant is refracted, the effect is not observable and hence planets do not twinkle. Q.34 What is a spectrum ? Why do different coloured rays deviate differently on passing through a glass parism ? Sol. The band of seven colours formed due to dispersion of white light is called spectrum. Different colours deviate at different angles as the speed of different colours is different in the prism. (i) The extent of deviation of a ray of light on passing through a glass prism depends on its colour. (ii) Lights of red colour are used for danger signals. Sol. (i) The speed of light in the prism depends on its wavelength. 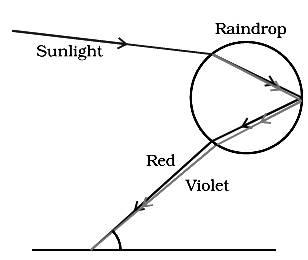 Speed of light of smaller wavelength (violet) decreases more than larger wavelength (red). Hence the extent of deviation depends on the colour of light. (ii) As red colour deviates the least , it is used for danger signals. 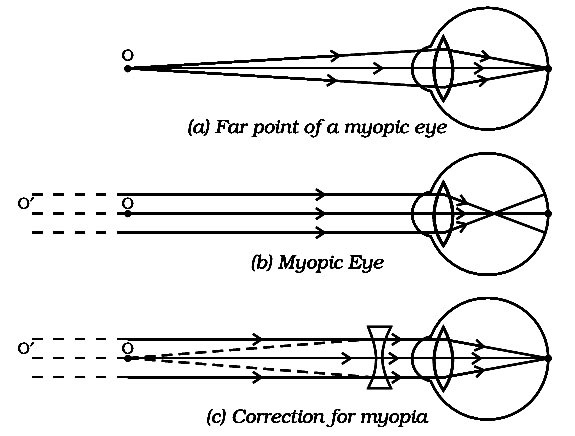 Q.36 What is myopia (near - sightedness) ? Draw a ray diagram to show how it can be corrected using a lens. Sol. Myopia : In this defect a person is not able to see faraway objects. This may be caused by the elongation of eyeball on excessive curvature of the converging system of eye. The image is formed in front of the retina. This defect can be rectified by the diverging the rays by using concave lens. Q.37 What is hypermetropia (far - sightedness) ? Draw a ray diagram to show how this defect can be corrected using a lens. Sol. Hypermetropia : In this defect, a person is unable to see nearby objects, whereas far away objects can be seen. This may be caused by the eyeball being short or less convergence of the rays entering the eye. 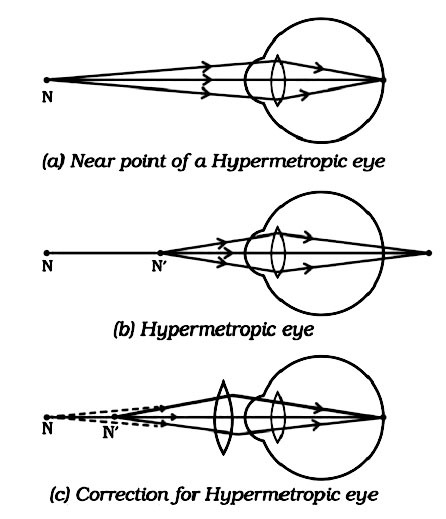 Hypermetropia can be corrected by using convex lens of appropriate focal length. Q.38 What is meant by spectrum of white light ? How can we recombine the components of white light after a prism has separated them? Draw a diagram to illustrate it. Q.39 An old person is unable to see clearly nearby objects as well as distant objects. (a) What defect of vision is he suffering from ? 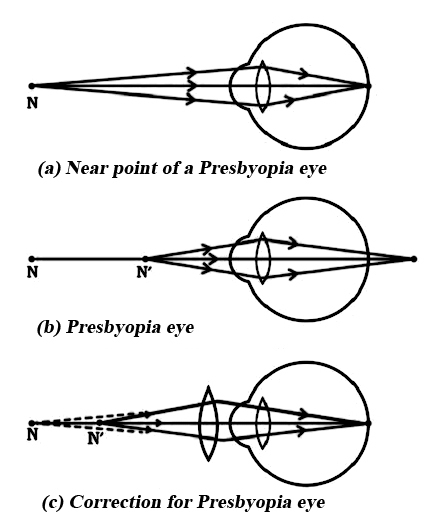 (b) What kind of lens will be required to see clearly the nearby as well as distant objects ? Give reasons. Sol. (a) He is suffering from myopia and presbyopia . (b) He will need a bifocal lens. Concave lens to see faraway objects and convex lens to see nearby objects. 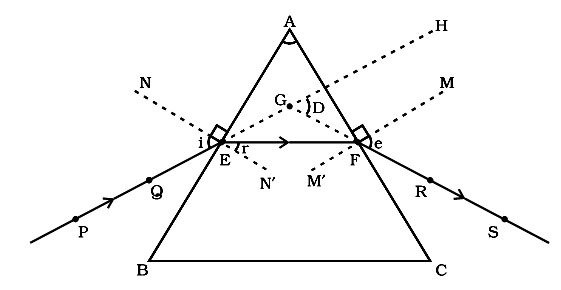 Q.40 Study the diagram given below and answer the question that follow it. (a) Which defect of vision is represented here ? Give reason for your answer. (b) Draw ray diagram to show the correction of this defect by the use of a suitable lens. (i) back seat (ii) front seat. Q.42 We see advertisement for eye donation on television or in newspaper. Write the importance of such advertisements. (ii) Motivate people to donate eyes. (iii) Give awareness of the benefit to other people after one's death. Q.43 State the difference in colours of the sun observed during sunrise / sunset and noon. Give explanation for each. Sol. When the sun is overhead, all the components of sunlight are reaching the earth, so the sky appears white. When the sun is near the horizon, blue colour is scattered away, so the sky appears red in colour. Q.44 When and where do we see a rainbow ? Draw a labelled diagram to illustrate the formation of rainbow. Sol. A rainbow is a natural spectrum of light observable after rain in a direction opposite to sun. It is produced by the dispersion and reflection of light from droplets of water after a shower. 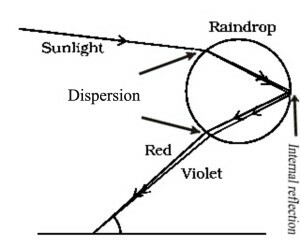 Q.45 Draw a diagram to show dispersion of white light by a glass prism. Label the colour that appears at the two ends of the colour bands. When white light passes through a prism, the different colours deviate at different angles due to the difference in their velocities when they pass through the prism. This causes dispersion of light. (i) defect of vision and also (ii) for its correction. Sol. The old man is suffering from presbyopia. It can be corrected by using convex lens. 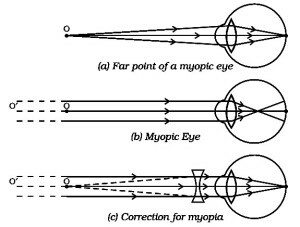 Myopia : In this defect a person is not able to see faraway objects. This may be caused by the elongation of eyeball on excessive curvature of the converging system of eye. The image is formed in front of the retina. This can be rectified by diverging the rays by using concave lens. Q.48 What is meant by the term 'power of accommodation' of human eye ? How does it help a person to see nearby as well as distant objects clearly ? The power of the eye by which it can see nearby objects as well as faraway objects by changing its focal length is called its power of accommodation. When an object is placed nearby, the ciliary muscles make the lens thicker, increasing its converging power so that image is formed on the retina. When object is at a distance the ciliary muscles releasing, increasing the focal length so that image is formed on the retina. Q.49 What eye defect is hypermetropia ? Describe with a ray diagram how this defect of vision can be corrected by using an appropriate lens. Q.50 (a) What is meant by the power of accommodation of an eye? (b) A person with a myopic eye cannot see objects beyond 1.2 m directly. What should be the type of the corrective lens used ? What would be its power ? Sol. (a) The power of the eye by which it can see nearby objects as well as faraway objects by changing its focal length is called its power of accommodation. Q.51 (a) What are the values of (i) near point and (ii) far point of vision of a normal adult person? (b) A student has difficulty in reading the blackboard while sitting in the last row. What could be his defect of vision ? Draw a ray diagram to illustrate this defect of vision. Sol. (a) (i) 25 cm. Q.52 Name the three common defects of vision. What are their causes? Name the type of lens used to correct each of them. Myopia is caused when image of faraway objects is formed in front of retina. This may be due to elongation of eyeball or excessive curvature in cornea. This defect may be corrected by concave lens. Hypermetropia is caused when image of nearby objects is formed behind the retina. This may be due to flattening of eyeball or less curvature of cornea. This defect may be corrected by convex lens. Presbyopia is caused due to weakening of ciliary muscles. Image of nearby object are formed behind the retina. This defects is corrected by convex lens. Q.53 A beam of white light falling on a glass prism gets split up into seven colours marked 1 to 7 as shown in the diagram. A student makes the following statements about the spectrum observed on the screen. (a) The colours at positions marked 3 and 5 are similar to the colour of the sky and the colour of gold metal respectively. Is the above statement made by the student correct or incorrect ? Justify. (ii) 'danger' or stop signal lights? (a) Which defect of vision is represented in this case? Give reason for your answer. (b) What could be the two causes of this defect? (c) With the help of a diagram show how this defect can be corrected by the use of suitable lens. Sol. 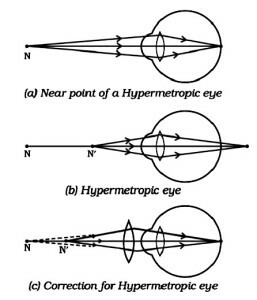 (a) Hypermetropia. A person cannot see faraway objects but can't see nearby objects. (ii) Greater focal length of eye lens. Q.55 (a) A student cannot see clearly a chart hanging on a wall placed at a distance 3 m from his eye. Name the defect of vision he is suffering from. Draw a ray diagram to illustrate this defect. List its two possible causes. (b) Draw a ray diagram to show how this defect may be corrected using a lens of appropriate focal length. (c) An eye donation camp is being organised by social workers in your locality . How and why would you help in this cause ? (c) By spreading awareness about eye donation. One person's eye donation may give sight to two blind persons, enlightening their lives. Q.56 (a) List the part of human eye that control the amount of light entering into it. Explain how ? (c) If due to some disease or injury, the cornea of an eye is clouded, then the vision is impaired and the person may become blind. This type of blindness may be cured by replacing the defective cornea with the cornea of the donated eye. Suggest some measures for motivating people to donate their eyes after death. Sol. (a) The iris controls the amount of light entering the eye through the pupil. In dim light the iris increases the size of pupil to let more light enter the eye. In bright light, it contracts the pupil to reduce the amount of light entering the eye. (b) The function of the retina is to send the information of the image formed on it to the brain via optic nerve. (c) Make people aware that donating eye after death will give vision to two people and reduce their sufferings. Q.57 (a) What is dispersion of white light ? What is the cause of such dispersion ? Draw a diagram to show the dispersion of white light by a glass prism. 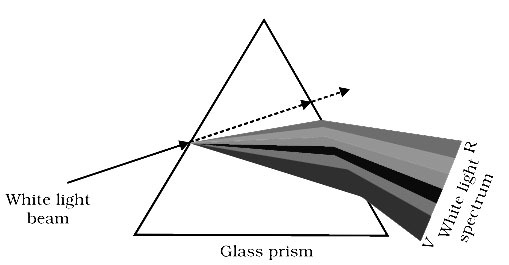 (b) A glass prism is able to produce a spectrum when white light passes through it but a glass slab does not produce any spectrum. Explain why is it so ? 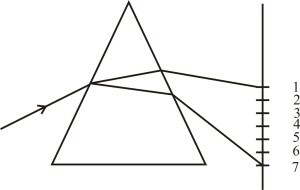 (b) In a glass prism, the opposite faces of the glass are not parallel. This makes the different colour to deviate at different angles and causes dispersion. In a glass slab, the emergent rays are parallel, so they do not spread into different colours. They recombine to give effect of white light only. Q.58 A 14 - year old student is not able to see clearly the questions written on the blackboard placed at a distance of 5 m from him. (b) With the help of labelled ray diagrams show how this defect can be corrected. In this defect, image is formed in front of the retina. So a diverging lens is used to diverge the rays so that image after convergence from eye lens is formed on the retina. This is done by using concave lenses. 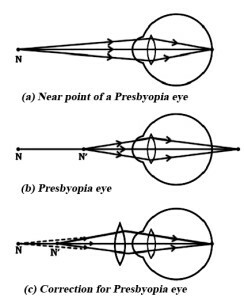 (i) Myopia (ii) Astigmatism (iii) Bifocal lenses (iv) Far - sightedness. (b) Why is the normal eye unable to focus on an object placed within 10 cm from the eye ? (ii) Astigmatism - In this defect the eye cannot focus objects both horizontally and vertically at the same time. It is corrected by using cylindrical lenses. (iii) Bifocal lenses - These are lenses which have both concave and convex structure. These are used when a person is suffering from presbyopia and myopia. (iv) Far- sightedness: When a person can see faraway objects but not nearby objects. It is called far sightedness. This defect is corrected by using convex lenses. (b) To see on object placed at a distance of less than 25cm, the ciliary muscles have to make the focal length still smaller, Which puts strain on the ciliary muscles and they cannot make the focal length so small. Hence it is not possible to see distance lens then 25 cm.